Life insurance should be considered in each and every household. Here are five things to make understanding life insurance easier. If you are stably retired or financially independent, where no one would suffer financially if you were to die, you do not need life insurance. Life insurance is a contract, called a policy. 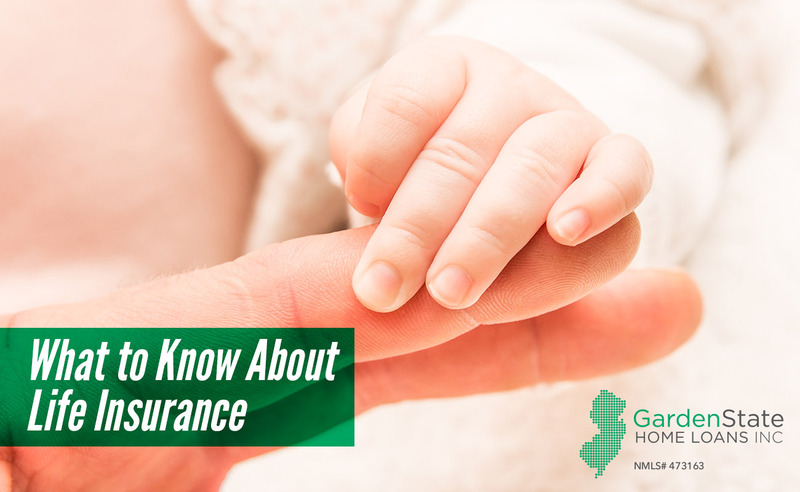 The policy is between the life insurance company and the person who is getting the insurance. The company pools the premiums of policyholders and pays out claims in the event of a death. The insurance company’s profit comes from the difference between the premiums taken in and the claims paid out. The insurer is the insurance company. They are responsible for paying out claims in case of death. The owner is the person responsible for premium payments to the insurance company. The insured is the person who the policy is based on. Finally, the beneficiary is the person or other entity who will receive the insurance claim in the case of the passing of the insured. A person can be both the owner and the insured of a life insurance policy. There are two broad types of life insurance, term life and permanent life. Term life is the simplest and least expensive form of life insurance. This type of insurance is based on the probability that the insured will pass in a specific period of time. This is typically ten, twenty, or thirty years. After that period, you can either let the insurance policy lapse or you can continue to pay for it yourself, which can mean premiums for a length of time. Permanent life insurance includes the probability-of-death calculus and a savings mechanism. These policies are referred to as “cash value” and are designed to exist forever. There are a few different forms of permanent life insurance. Whole life is the original form, which has an investment component similar to bonds. Variable life offers investment options similar to mutual funds. Finally, universal life is designed to be a less expensive permanent life insurance alternative. However, it has an increased interest rate risk. It’s always important to protect your home from being burglarized, but how do you do it? 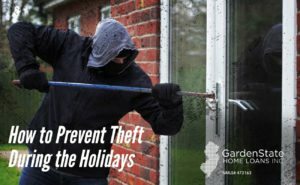 Here are a few ways to protect your home from theft, both on the outside and the inside. Overgrown shrubbery provides an easy spot for thieves to hide when attempting to break in. Eliminating hiding places may also eliminate your chances of getting broken in to. You may even want to consider planting thorny bushes around your windows to make it difficult, and painful, to break into your home. 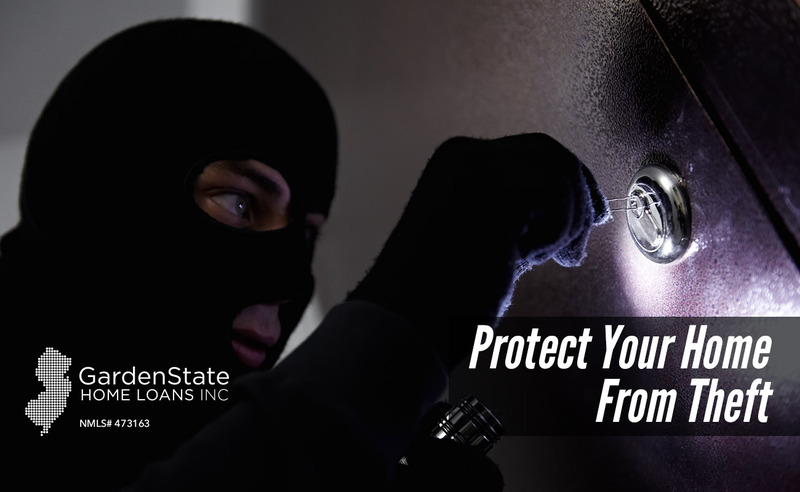 If you have a two-story home, a thief may scale a tree to attempt to get into an upstairs window if the branches are long enough. Narrow down that chance by keeping your trees close to your home pruned. A fence made with a chain-link or ornamental fencing works well to protect your home, especially if they are secured into concrete to prevent them from lifting. Solid fences are easier to climb and offer even more places to hide! If you still prefer a solid fence, you can secure them better by using sharp, pointed tops. Expensive items, such as a car or a grill, left out in the open makes your home an easy target. While it may seem like a hassle to have to get these items out of your garage or shed every time you want to use them, it’s definitely worth it. Thieves don’t even need to enter your home to steal these items. If your area only has street parking, keep your car locked and be sure to park in well-lit areas. Install motion-sensor lights around all entrances for your home and around the garage. In addition to adding extra lighting, the motion sensor will detect the thief before they can even make it to the door or window. It has been shown that crime is lower in tight-knit communities because neighbors are more likely to look out for each other. Neighbors offer extra eyes, especially if you aren’t home for the day or are away on vacation. Odds are these areas won’t need sunlight. Use curtains to cover any windows in these spots to add extra privacy and hide any items that you have stored there. When moving into a new home, make sure to change the locks as soon as possible. If you are moving into an apartment, ask the landlord to change them. Even if the previous tenant has handed in their keys, you have no way of knowing whether that person made and distributed other copies. Open doors and windows are an invitation in for burglars. Make sure that all exterior doors have deadbolt locks and that windows lock securely. A thief can easily spot a window that can be forced open. Lock your door when you leave your house, no matter how long you will be gone. Get a lockbox to secure your valuables in. If the lockbox is small and isn’t mounted on the wall, consider bolting it to the floor. Often, a burglar will take the box with them, so don’t give them that opportunity! There are many different security systems with countless features. Find the ones that best fit your needs and install them in your home. Make sure that the company you choose is well-known and has good reviews. After the system is installed, make sure you use it! A real threat to your home during the winter is your pipes. When water freezes, it expands, which can cause your pipes to burst and your home to flood. The damage caused to your home can be monumental, and on average, amounts to about $18,000 in damages. 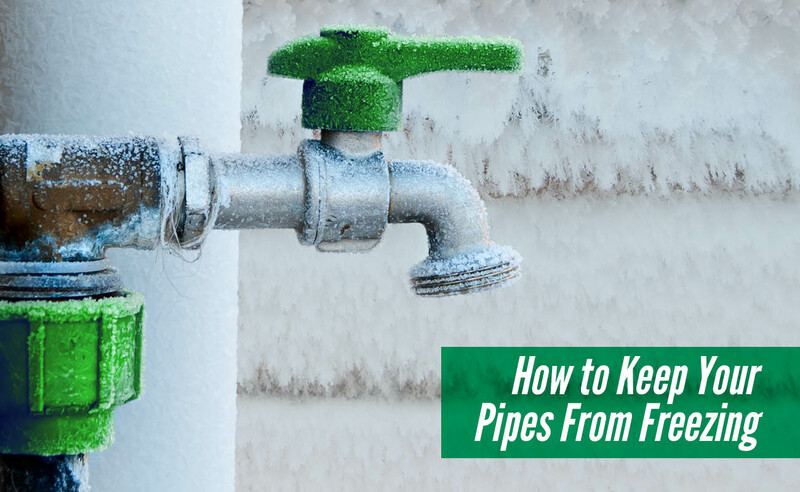 Here’s how to keep your pipes from freezing. Getting the water out of the pipes certainly helps. If there’s no water in the pipes, there’s no chance of it freezing! To do so, tackle any water lines leading to your garden hose, pool, and/or sprinkler. After the water valves are shut off, open the spigots to let out any remaining water. Let your faucets drip once temperatures drop below freezing. Allowing water to run through a pipe helps to prevent the pipes from freezing. It doesn’t have to be a stream, just a trickle will do! The running water helps to relieve any pressure building up from ice inside. Indoor pipes can also be an issue when temperatures drop below freezing. One way to reduce this risk is to keep any bathroom or kitchen cabinet doors open that contain pipes. The improved airflow keeps the pipes warmer. This is especially important in areas that are left unheated or are not insulated. Such spaces can include your basement, attic, or any crawl spaces. Any piping in these areas should be insulated using an insulation sleeve or wrapping, both of which can be purchased at a local hardware store. Many people take vacations during the winter. If you are traveling during the holidays or taking a family vacation, it’s a good idea to turn your water off completely while you are gone. Unused water is most likely to freeze, which can lead to pipes bursting. You definitely don’t want to come home to a flooded house! The water shut-off valve is usually located where water pipes enter the home. Typically, this is in the kitchen, basement, or a downstairs bathroom. If you are unsure of where your water shut-off valve is, check your property records. Winter storms occur when the temperature is low enough that precipitation forms as sleet/snow, or rain turns to ice. They can make roads and walkways dangerous and can close or limit important community services. The term winter storm covers a variety of weather conditions, from freezing rain and ice to a moderate snowfall, to a blizzard. In any of these cases, here’s how to remain safe during the storm. There is a fair bit you can do before the storm to prepare. 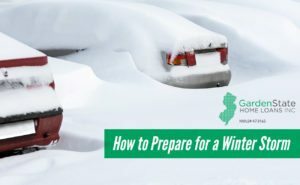 Here is what you should do to prepare before the storm hits. Bottle water. If your power goes out, bottled water is a great way to remain hydrated, wash any fruits or vegetables, and to wash your body. You can also purchase gallon jugs of water as well. Before a winter storm hits, make sure your home is well insulated and that your windows and doors have weather stripping around them. This keeps the cold air outside and the warm air inside. You may also want to install storm windows as an extra precaution. If you don’t have time to install new windows, consider covering your windows with plastic from the inside to act as an extra barrier to the cold. Make sure that your carbon monoxide detectors are functioning and that everyone in the house knows how to use a fire extinguisher. If you have a wood burning fireplace, consider moving some wood inside so you can burn it to keep you warm. Your chimney should be inspected to ensure that it can function properly before you use it. In addition to the wood for a fireplace, make sure to stock up on additional sources of heat such as extra blankets, sleeping bags, and winter coats. Create an emergency kit that is specifically designed for your car. Some items to include are portable phone charger, an extra blanket, an ice scraper, sand for traction, and jumper cables. You should also make sure that your gas tank is at least half full. Try to stay inside during the storm. If you must drive, make sure to take extreme precaution and don’t travel alone. When outside, wear layers of loose-fitting, lightweight clothing instead of one layer of heavy clothing. Outer garments should be tightly woven and water repellent. Wear mittens, a hat, and cover your mouth with a scarf to reduce heat loss. If your clothes get wet, get changed as soon as possible. Wet clothing loses all its insulating value. If shoveling, avoid overexertion. Take breaks, push the snow instead of lifting whenever possible, and lift lighter loads. Listen to any local news or radio stations for information concerning road closures and other such information. Avoid driving until these conditions have been cleared. Fire safety is very important, but it doesn’t stop at having fire extinguishers and alarms installed throughout the house. You and your family should have a fire escape plan in place should a fire start. Here are some things to include in your fire escape plan. To start out, draw a map of your home to map out all rooms and possible escape routes. Plan at least two ways to escape from each room. If you live in an apartment building, make sure you know where all exit stairways are on your floor of the building and plan as many escape routes as possible to get to them. Always plan to use the stairs if you live in a high-rise, never the elevator. If you live in a home, you can use a window as an alternate route. Purchase a collapsible ladder to escape from any upper-story windows. Once you have a plan on how to escape the home, make sure you plan for everyone in the home. If you have infants, older relatives, or family members with limited mobility make sure to assign someone to help them exit the home. Have a backup person as well in case the person assigned isn’t home at the time of the fire. Assign a meetup point away from the home and make sure everyone knows where it is. Make sure everyone knows that once you are out of the home, you should not go back in. If someone is missing, firefighters have the equipment to safely perform any rescues needed. Check windows to make sure that they open easily. If any stick, make sure to fix them so they can open. Make sure that any security bars on doors and windows have a quick-release latch and that everyone knows how to use them. Additionally, make sure that your home or building number is visible from the street. When explaining the plan, especially to children, make sure they know not to hide during a fire. Have everyone in the home memorize the emergency number for the fire station, so they can call from a cell phone or neighbor’s phone as soon as they exit the hone. Make sure to explain and implement prevention plans. Install fire alarms in every sleeping room, outside each sleeping area, and on every floor of the home. Fire alarms should be connected, meaning that if one fire alarm goes off, all of them go off. If a fire occurs, closed doors can help to slow the spread of smoke, fire, and heat. 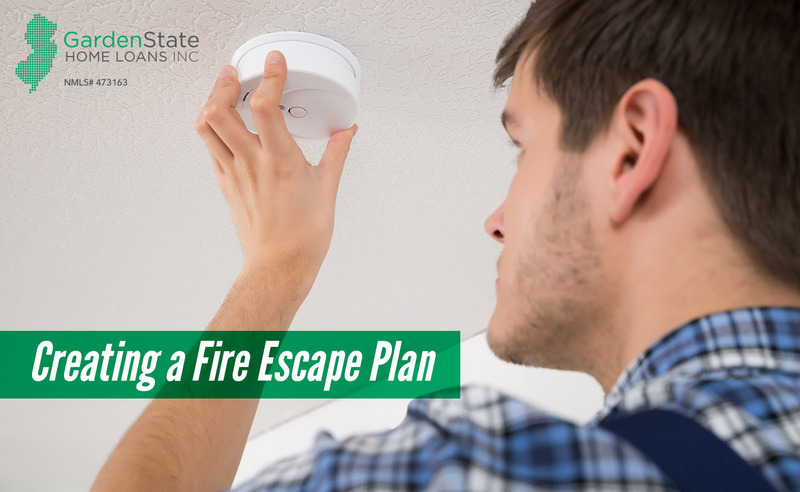 Practicing a fire escape plan is as important as creating one. Practice your plan at least twice a year, and try to make it as realistic as possible. To practice, try getting out of your home with your eyes closed, mouth covered, and crawling low to the floor. 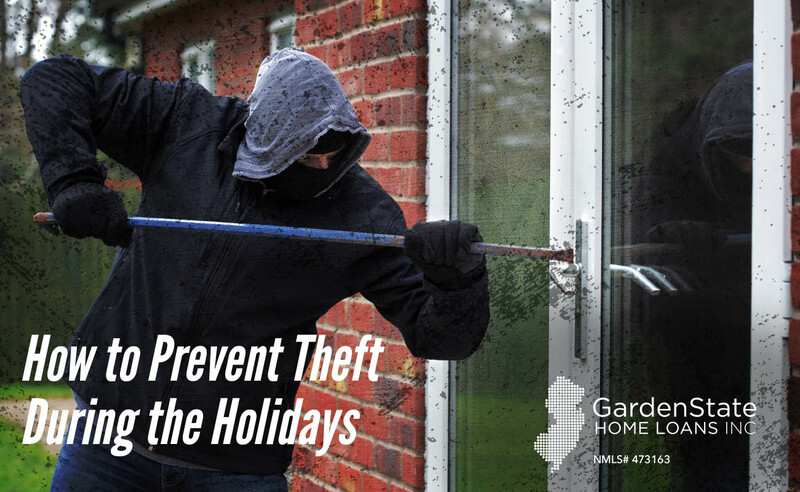 Unfortunately, the possibility of theft increases during the holiday season. Here are some things that you can do to help prevent theft. Try to leave the light on when you’re gone. Unoccupied homes make great targets for burglary. Hide the signs of a vacant home being leaving a light on, or keeping them on timers, and putting your holiday lights on timers. This gives the appearance of someone being home. If you are going from store-to-store shopping for gifts, be sure to hide your presents as you move onto the next place. Keep bags in your car’s trunk, make sure to park in well-lit areas, and lock your doors. When leaving your home, make sure to lock all your doors, not just your front door. Burglars don’t only go through the front, so check on the side, back, and patio doors. You should also check your windows to make sure hardware is secure. Try not to post about your travel plans online. This includes when you are leaving and when you are getting back or where you are going. If you are traveling, use basic luggage instead of a designer to avoid drawing attention from thieves. Keep your eyes on your bag when going through security. Keep your bag close to you as you put your shoes back on after your security check and while at the gate. Make sure your bag is turned with the zipper close to you. You can even use a travel lock to lock your bag closed. Let your neighbors know if you are traveling so they can keep an eye on the house and report any suspicious activity. Additionally, ask your neighbors to bring in your mail and newspapers, so it’s not building up. This is a dead giveaway that you are not home. If you are doing a lot of online shopping, you may want to customize the delivery times to ensure you are home when the package arrives. You can also choose to have your packages held at the carrier’s location or have it sent to an Amazon locker if you don’t want to have it sent to your home. For any items with a large price tag, take note of as much information as possible. Take a picture of the item to store on your phone or computer, write down any serial numbers associated with the product, and the price. In the worst-case scenario, this will make it easier to track down any stolen items or reimburse you. An estate encompasses everything you own. This includes your car, home, checking and savings account, and other personal possessions. The common ground among these is that you can’t take them with you when you die. Estate planning includes planning in advance, which names who you would want to receive your things after you die. 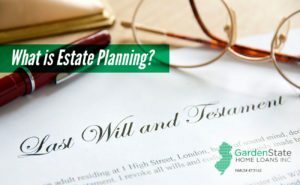 What are estate planning tasks? Estate planning is an ongoing process. Your plan should be reviewed as your family and financial situation changes over time. A will provides instructions. However, it doesn’t avoid probate. The probate process varies from state to state. It can be expensive and includes fees such as legal fees, executor fees, and court costs. Assets that go through probate include anything that is titled in your name or controlled by your will. Not everything goes through probate, however. Any assets or property that are jointly owned is not controlled by your will. In this case, these possessions are transferred to the new owner. A trust doesn’t need to die with you. Any assets in a trust can stay in your trust, managed by a trustee, until a beneficiary reaches the age you designated for inheritance. There are many reasons for a trust. Among these reasons include providing help for someone with special needs or protecting assets from someone who irresponsibly spends. Estate planning is for everyone. We can’t predict how long we will live; illness and accidents happen. It’s good to be prepared. https://www.gardenstateloans.com/wp-content/uploads/2017/12/estate-planning.jpg 800 1300 Dori Gelman https://www.gardenstateloans.com/wp-content/uploads/2017/05/fb_logo-300x141.jpg Dori Gelman2017-12-06 09:30:062017-12-06 09:17:22What is Estate Planning? One of the most important parts of your home to be structurally sound is the roof. 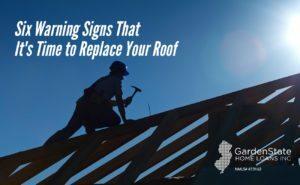 If you are unsure whether your roof needs repair, look for any of these six signs to see if it’s time to replace your roof. Before even looking on the outside, the first place you should check is in the attic. Climb under the eaves and look for beams of light coming through the top of the house. You should also look for any stains or streaks, which can be a result of a leaky roof. Review home improvement records to see when the home last had the roof replaced or reshingled. Typically, a shingle roof will last 20 to 25 years. If your home has an additional layer of shingles on top of the original, it should be replaced after 20 years. Shingles on a roof should lie flat against a roof. If you find patches with cracked, damaged, or buckling shingles, this is a sign you should replace your roof. Missing shingles is another sign that the roof needs to be repaired. While checking the shingles, look in the gutters and downspouts for shingle granules. If there are a lot of granules, it’s likely that your roof is nearing the end of its life. A drooping and sagging roof indicates that a roof should be replaced as soon as possible before any further damage to your home is incurred. Check for rotting boards or sagging spots, especially in the low points of your roof. Moss (and mold and fungi) suggests there might be trapped moisture, which can ruin a roof. Use a stiff brush to get rid of any moss that’s collecting in shady corners. Be careful not to cause further damage to the roof. Not everything means that you need to get your full roof replaced. A few damaged shingles or you have a tiny leaky doesn’t mean you must get a whole new roof. A roof that’s been properly installed and is younger than 15 or 20 years will likely be able to get by a small repair. If you are concerned, contact a licensed roofing contractor. 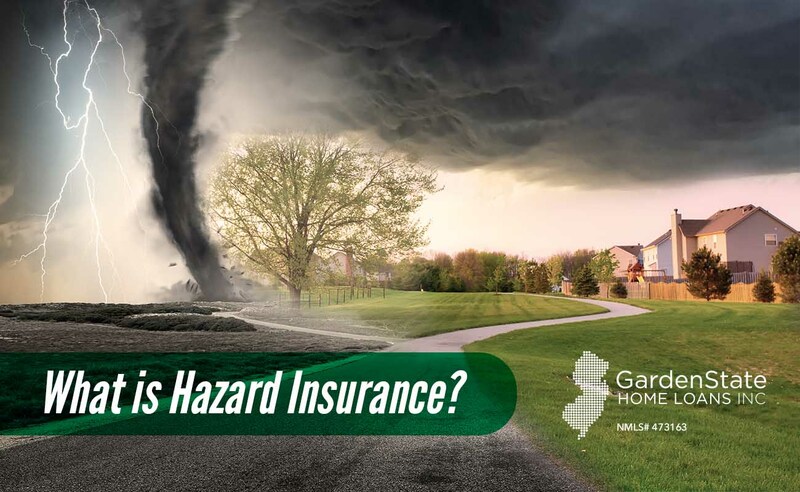 Are hazard insurance and homeowner’s insurance the same thing? Well…not exactly. Hazard insurance protects the homeowner against any structural damage that is caused by natural disasters. However, homeowner’s insurance is a financial protection against theft and other damages to your home and belongings. Hazard insurance will only cover the cost to repair or rebuild your home. If you have personal damages as a result of the disaster, that would require homeowner’s insurance. What are the main differences between hazard insurance and homeowner insurance? An insurance agent will help you design a policy to cover the cost of your personal property, liability, and other basic coverages. Additionally, a policy will also include protection against hazards. However, many mortgage lenders will require you to have supplemental hazard insurance based on where you live. For example, if you live in the Midwest, your lender will most likely have you purchase tornado coverage for your home. Before purchasing a home, talk to an insurance agent who you trust. They will help you get the right insurance policy to cover you in case of emergency. https://www.gardenstateloans.com/wp-content/uploads/2017/11/hazard-insurance.jpg 800 1300 Dori Gelman https://www.gardenstateloans.com/wp-content/uploads/2017/05/fb_logo-300x141.jpg Dori Gelman2017-11-28 09:30:102017-11-28 09:16:56What is Hazard Insurance? Clothes dryers can be found in approximately 81.5 million homes throughout the United States. While they are a major convenience, if they are not properly cared for, they can cause fires. Most dryer fires are caused by extra lint. Extra lint builds up when the dryer is not cleaned on a regular basis. In addition to keeping your dryer clean, make sure that there is proper air flow around the unit. If there is not proper air flow, the heat can cause combustion. 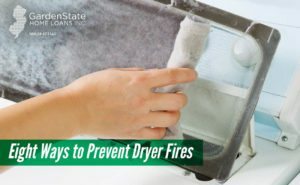 How can you prevent dryer fires? Clean your vents and your entire dryer on a regular basis. Don’t assume that the vent will catch all the lint from your laundry loads. Lint can build up inside of the dryer or other heating elements. Make sure to clean the lint screen before or after doing a load of laundry. If after a cycle your clothes are still damp, this could be a sign that the screen or exhaust duct is blocked. In the event your dryer has a fire, any items close to the dryer will fuel the flames. Keep the area around the dryer clear to prevent the fire from getting larger than necessary. An outlet that doesn’t have enough power to withstand a dryer will blow a fuse. Overloaded electrical outlets can spark fires. It is not safe to leave your dryer unattended. If there is an issue, you most likely be able to hear the problem before it can manifest into a fire. Make sure that you will be able to stay home for the entirety of the drying cycle. Look outside the dryer vent to make sure there is air flow surrounding it. If you are unable to see air escaping while the dryer is running, disconnect the vent and exhaust while cleaning them. Make sure that you reconnect everything before doing your next load of laundry! Rigid or corrugated semi-rigid metal ducts help to prevent fires in the dryer’s ductwork. If you have a plastic or foil accordion-type duct, consider replacing it. 8. What happens if your dryer catches on fire? The only way to protect yourself is to be prepared. In the case that your dryer does catch on fire, call 911 immediately.